"A History of the Sport of Steelheading in British Columbia"
The beauty and power of steelhead in British Columbia have always attracted anglers. It would be difficult to select a specific time or place where steelheading began in British Columbia. Early writers at the turn of the century spoke of the 'steel head' or 'iron head' trout that frequented the many rivers of the province both on the coast and in the Interior. It is certain that the natives caught and used these fish much like they did Pacific salmon. We do know that historically these fish were caught in some of big lakes and their tributaries in the Interior including, Okanagan Lake and Shuswap Lake . But, damming of the Columbia system stopped any access to Okanagan lake and the highly productive Okanagan river. One of the earliest reference I can find relating to the sport of steelheading comes from F.G.Aflalo's book, "Sunset Playgrounds", 1909. In his chapter on British Columbia he states, "For the fisherman Vancouver Island is holy ground by reason of the splendid sport obtainable with steelhead trout in the Cowichan River ." Unfortunately he does not describe steelheading but must have obtained this information from anglers in Victoria where he was staying. 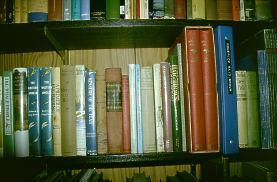 T.W.Lambert in his book, 'Fishing in British Columbia', 1907, is considered by many to have the first printed account of fishing steelhead in B.C. and the Thompson River in particular. 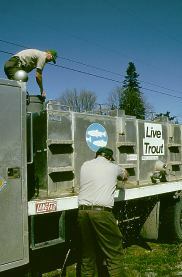 Today, provincial fisheries staff play an important role in managing and stocking steelhead for anglers. A Bryan Williams, B.C. 's first Provincial Game Warden, gives this detailed colorful description of steelhead fishing in his book, 'Rod & Creel in British Columbia', 1919. "As a sporting fish the steelhead has no equal. He can be taken on the fly, or by spinning with a minnow or prawn, as well as with bait. As a fighter there is nothing to beat him, he will jump perhaps four or five times in succession and make long runs or flying dashes upstream or downstream and in every direction, so that a cool head and skillful hands are needed to bring him to the gaff." It is interesting to note that Williams divided steelhead into two groups, Coastal Steelhead (Salmo gardnerii) and Interior Steelhead ( Salmo gardnerii kamloops). The latter group were landlocked steelhead found in large lakes and he states, "The lake fish grow to a larger size than the coast fish, but not having a strong current to assist them when hooked, do not afford as much sport." Sir Charles P. Piers, in his book, "Sport & Life in British Columbia," 1923, has this to say about steelhead; "Good trout fishing can be obtained in most places, and the 'Steelhead' - a huge sea trout - gives the finest sport imaginable." The first major reference about B.C. steelhead was prepared by J.R.Dymond of the Department of Biology, University of Toronto, and published by the then Department of Fisheries, 1932. In this book, "The Trout and Other Game Fishes of British Columbia," much biological information is given with details of runs in a number of rivers. In this book, Dymond has this to say about the sporting qualities of steelhead; "There are few finer game fish than the steelhead. They rise readily to the fly both in fresh and salt water." He also quotes A.A. Easton, Fishery Inspector as follows; "Steelheads are game fighters to the end, and good tackle is essential. 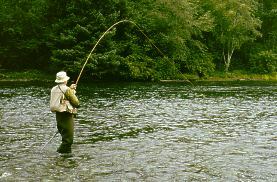 I recommend a double-handed, sixteen foot rod, at least three hundred feet of medium salmon line and heavy sea trout casts. When hooked, these fish generally go away with a tremendous rush for perhaps sixty to seventy feet, and at the end of it leap high out of the water, and should they succeed in getting into rough and broken water, as they usually attempt to do, you have all your work cut out to hold them". Roderick Haig-Brown wrote 28 books about B.C. and the angling resources of this province. It is obvious reading the various printed references to the sport of steelheading that British Columbia steelhead angling tackle was determined during the decade of the 20's and 30's. Various authors describe long rods and single action 'spinning' reels for casting. 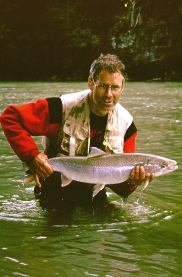 Roderick Haig-Brown, in what has become the classic reference for early British Columbia steelheading, "The Western Angler", 1939, states the following preference for winter steelhead fly fishing; "A sensible man, fishing a large fly in a river like the Campbell, would use a twelve- or thirteen-foot double handed rod. It is easier, more comfortable and less tiring than fishing a single-handed rod heavy enough to cast a 2/0 fly. I do sometime take out a double-handed rod, if the river is particularly high. But nearly always I use an eleven-foot, single-handed Hardy Wye rod with a No.5 King Eider double tapered line." Bryan Williams in his second fishing book, "Fish & Game in British Columbia", 1935, states; "The ideal (steelhead) rod should be a 10 or 11-foot split cane or good greenheart ..." For the reel he has the following observation; "... if you cannot afford the finest of everything, put your money into your reel, as without one of the best your troubles will be many and your successes but few." Many writers began to write in detail about steelheading after W.W.II, some with regular columns in province wide newspapers like 'Pintail' in the Daily Province, followed by Mike Crammond, and, Lee Straight who wrote a regular outdoor column for the Vancouver Sun. Many articles on B.C. 's steelheading were written for regional, national and international magazines by experienced steelheaders. This fly fisher, on a angler�s pilgrimage from Germany, plays a steelhead in Campbell River waters made famous by the writings of Roderick Haig-Brown. Likely 1968 is the next major bench mark for B.C. steelheading. for at this time the B.C. Fish & Wildlife Branch published the first detailed look at British Columbia steelheading. In their publication, "Steelhead Trout Sport Fishery Analysis", 1968, by G.R. Peterson & R.C. Thomas, Fisheries Management Report # 59, the first province wide steelheading questionnaire was analyzed which gave steelhead angler totals by regions, steelhead catches, and, detailed steelhead streams. This report has become the base for annual reports further analysing the sport of steelheading in British Columbia. In 1970, a decline in steelhead province wide and apparent unconcerned provincial and federal governments rallied steelhead anglers throughout the province. They met in Coquitlam and formed the Steelhead Society of British Columbia. This group has become the voice of the organized steelheaders and has played a prominent role in British Columbia's steelhead management, the sport of steelheading, and a provincial watershed environmental awareness.